A tale of being still and finding joy while travelling round the world. It’s 4.00am and I’m battling the desire to fully awaken. My body is in Sydney but on USA time after three weeks in Colorado on the ski trip of a lifetime. But like all exceptional travel what goes up must come down and I know sleep deprivation will only enhance the travel blues so I squeeze my eyes tight in the hope to force slumber even though I also know that forcing anything creates nothing but resistance. In the past three weeks I’ve been snowed in at the cosiest cabin in the history of the land of cosy cabins, broken my first waist deep trail while driving a snow mobile, scored the last two hottest tickets in town to the annual Telluride Aids Benefit and slept in penthouse style at Conde Nast fave Lumiere Hotel as five foot of snow silently dumped from the heavens outside, the same snow we scored fresh tracks on the next morning. My Facebook news feed over the past month was more suited to a Rockefeller than a Rachael. Add first tracks with a private instructor on the day of the season in Aspen, cat skiing on the second day of the season in Aspen and wining and dining at The Little Nell also in Aspen where I was laying my skied out head each evening and where I began to believe my own press, signing room service checks with a royal title. Princess Rachael. I won’t even mention my week in Vail. Though some schadenfreud devotees will be happy to know I got the lurgy for three of those six days. Thank god for the cilantro cocktails downstairs at Matsuhisa for helping me get through the Burton Open outdoor concert and my four bedroom apartment at Solaris to ease me into the skiing at Breckenridge, Vail and Beaver Creek. Ok, I’ll stop soon. Then top the whole three weeks off with a night of the season at Bottega’s then the 10th Mountain Whiskey Tasting Room and you could be forgiven for de-friending me. Ok, I’ve stopped now. A Colorado collage that only hints at the awesome time I had. Check out instagram.com/misssnowitall for more. Let’s just say I felt like the luckiest person in the world of luckiest persons. Yes it was a work trip, who can afford such splendour on a blogger’s wages? Not this writer, not yet anyway. Trouble is with all this Colorado love and devotion I now have the Colorado blues. But it’s not the Frette linen and French champagne I am craving, though a glass of Veuve right now would be nice, it’s the people. 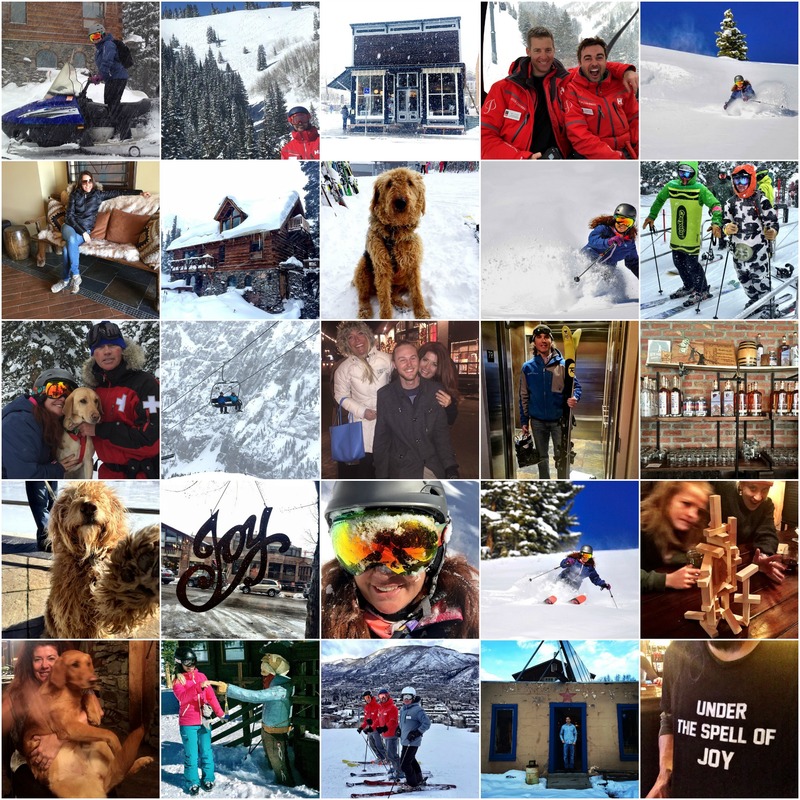 Americans drawn to the resort towns of Colorado are the best kind of Americans around. They are adventurous, wild, free, many with organic values that feed the community and all with a love of nature and all it brings. In short they are generous of soul and spirit. Combine this with most travellers desire to inhale it all (no Colorado legalisation of marijuana pun intended) and you have a recipe for so much fun, spark and life enhancement. Don’t get me wrong all the luxe trimmings are more than nice, ok they are downright divine and just quietly I was jealous of myself on this trip. But it’s who you share those trimmings, those experiences, those moments with that reveal the true connections that humans can have when they dare to put down the smart phone, step up and be in the moment with another person on the planet. If they don’t then they will miss the woman doing cartwheels in Allreds private club on the top of Telluride mountain because her husband has colon cancer and a dire prognosis and throwing her legs into the air with a hashtag #cartwheels4coloncancer gives her some moments of freedom and joy in an unsafe world. They’ll miss meeting that guy who lives in a yurt that he skis to each evening after working all day at a custom ski making factory where unicorns, Marilyn Monroe and snow leopards are all part of a top sheet graphic design day’s work. They’ll miss the double denim cowboy hat wearing fashion loving male in the second row of a country town fashion show that raises money for AIDS in a state where men are men and those same men are now prancing their tatts down a catwalk in hot pants. They’ll miss the moments of true stomach muscle tearing laughter stuck in a dark lift with a dear friend photographing herself upside down with a flash light. And they’ll miss an impromptu road trip from one ski resort town to another with a blue eyed stranger from Nashville who opened up for the first time that he can recall about the death of both his parents and how it has impacted him and his relationships throughout his life. An exchange of first names, a three hour drive and I never saw him again. And that’s the key to real travel, remaining open, saying yes, listening to your gut instinct that tells you if the stranger offering you a lift is going to chop you up into a thousand pieces and leave you in a hessian bag on the side of the road or be moved himself by the chance meeting of an Australian girl with her skin already peeled back in a good way. Take no chance, no risk, no vulnerability and expect no change, no growth, no joy. Speaking of Joy or my mother’s namesake… I’ve never been one to pay much attention to ‘signs’. But the presence of my mother guiding my trip was unmistakable (I lost my mum in October last year. You can read about it here, if you feel the need). There was the guy standing at the bar chatting to myself and a friend of mine in Telluride. When he turned around he was wearing a t-shirt that said “Under the spell of Joy”. I mean, really, who has a t-shirt that says that? If I was smart I would have swapped shirts but I don’t think he’d look so good in a shoestring lace top with bolero jacket. 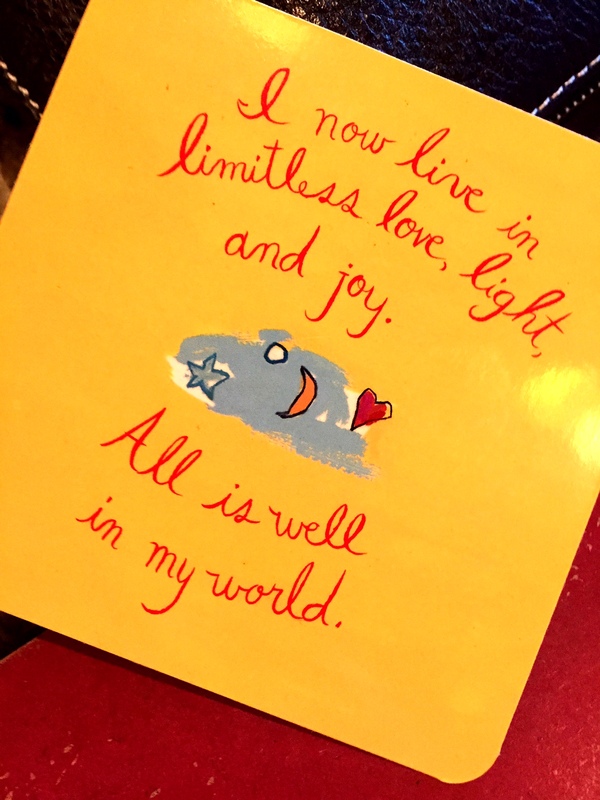 When I arrived in Aspen I arrived to a sign ‘Joy’ in a shop window hanging suspended from the ceiling and on a low travel day (we all get them) when I sobbed overtired and emotional into the head hole on a massage table at the beautiful Arrabelle day spa in Vail I came out to reception to find this card waiting for me. Find joy she seemed to be saying and pushing me in that direction constantly. Then there was the shift in time. The lurgy that floored me meant I had to change my return date to Sydney by a day so I had some time to recover. It also meant I missed my ski day at Breckenridge and the day late that I did arrive in Breck I was forced to take a different ski instructor and guide as the one originally set up was not available. Patty had been skiing in Breck for over thirty years and there was nothing she didn’t know about the mountain or village. She was kind and big hearted and when we skied in for a coffee I asked her about her ring. It was then the tears came from both of us. Turned out Patty’s mum had died around the same time as mine and the ring was her mother’s. Remember I wasn’t supposed to meet Patty, it was a sliding doors moment. A sliding doors moment that was one of many significant ones created by that simple change of return flight date, including a rocking last night. You’ve got to go with the flow when you travel and not hold on to a projected outcome and when you do delightful things occur. My mother loved to travel so it makes sense that I ended up a travel writer for some of my career. I love hello’s, I inhale new people and their stories like a newborn gasping for air and just like that newborn I glow with new life when that air is found (though I also love nothing more than a good lie down and a cup of tea in my own home). Give me a goodbye and I’ll run in the opposite direction doing anything but saying it. I will draw out a party till it’s very end and even then I’ll probably do a Houdini rather than actually say goodbye. If you haven’t figured it out already, this trip has restored my love of so many things, but most of all connection, connection with people, with uplifting emotions, with belly aching laughter, with nature, with living. Colorado can do that to you if you let it. I had two goals on this Colorado trip. One was to re-ignite my passion for skiing and the great outdoors which had sadly dissipated over the past two years. Colorado laid on the powder and the mountains and my passion has been fired. My second was to do a recce on various Colorado towns like the divine Telluride to find where I could see myself laying down my pen for six to twelve months to write the next book that has been sitting under my skin. I had long heard ‘they come for winter but stay for summer’ from my American ski friends and with nothing left to keep me in Australia this was forever in the back of my mind. Let’s just say the northern summer can’t come soon enough. Like travelling, if you don’t take a leap into life you gain nothing and if you don’t integrate what you learn from travelling into your life then you didn’t learn anything at all.